Overtime, asphalt will inevitably begin to deteriorate and breakdown. On average, your asphalt surface should have a lifespan of around 15-30 years, if properly and regularly maintained. But, there are also several damaging elements to asphalt that can affect its durability, strength, and how long it lasts. Your asphalt surface is meant to be driven and parked on. But, with that comes some potentially damaging substances that can spew from cars. If a car is leaking oil and it is constantly parked in the same spot, it will begin to break down this section of asphalt. When motor oil sits on top of your asphalt, it will begin to penetrate the surface and break it down slowly. This slow breakdown makes your blacktop more susceptible to cracks, crumbling, and creates vulnerability of the base. If you have large trees on your property, chances are their roots spread much farther underground than you would imagine. These roots are very strong and large and will often spread as far as necessary to acquire the necessary nutrients and water to thrive. If you have a large tree next to, or within the vicinity of you asphalt, there are likely roots growing under your driveway or parking lot surface. This growth can disrupt the base. Roots often shift to find nutrients and as they grow which can lead to cracks, and bumps. Your dark asphalt surface will typically run about 10 or so degrees hotter than what the outside temperature reads, especially on a day with abundant sunlight. When UV rays begin to break down your asphalt, it can become brittle and dried out, leading to damages. Incorporating sealcoating into your pavement maintenance regimen can go a long way in protecting it from these damaging UV rays to help slow down the deterioration process caused by sun damage. Pavement fatigue is a term used to describe progressive damages to asphalt from continued exposure to heavy loads and traffic. When we discuss traffic loads and its effects on asphalt, there are several aspects to consider; contact pressure, wheel load, speed, and axle configuration. Visit our blog Can Traffic & Vehicle Loads Affect Pavement for a detailed description of how these aspects distress asphalt. Also, find out which areas of pavement are more susceptible to potholes HERE. Water is the number one most damaging element to asphalt. 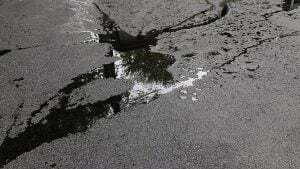 Areas on your pavement that experience continued standing water and puddles can lead to deterioration of your asphalt and its base. Overtime, water will begin to break down asphalt and decrease the overall strength and durability of the asphalt mixture, causing cracks. Once the surface is cracked, the water can now travel down and penetrate the base. Each time this area puddles, the damage is accelerated and increases in severity. Proper drainage and regular asphalt repair and maintenance are the best ways to avoid damages associated with water! Read more in our blog, Water’s Effect On Asphalt Pavement Deterioration. 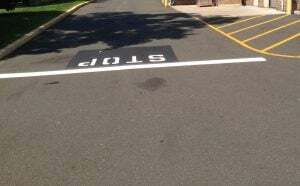 When it comes to paving your parking lot, first and foremost, make sure to hire a reputable contractor that will install your blacktop correctly and with the best materials possible. If an asphalt surface is not installed correctly, deterioration will begin much quicker than anticipated, especially when coming into contact with these damaging elements. When hiring EastCoat Pavement Services for your commercial asphalt paving job and regular maintenances required after install to preserve the quality of your asphalt, you are hiring a contractor with over 20 years of experience in commercial paving. Starting with our free consultation, we will make sure to conduct a thorough analysis and site inspection and answer any questions you may have. We work closely with each of our clients to create a custom plan for your unique property! Contact us today for your free consultation, and let us ensure that your asphalt is installed correctly the first time!